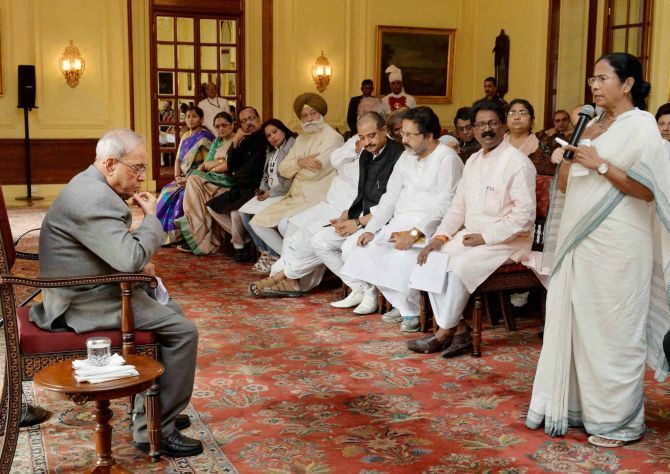 Seeking immediate withdrawal of demonetisation exercise, West Bengal Chief Minister Mamata Banerjee on Wednesday met President Pranab Mukherjee along with leaders of National Conference, Aam Aadmi Party and National Democratic Alliance ally Shiv Sena and submitted a memorandum voicing serious concern over the crisis arising out of ban on Rs 1000 and Rs 500 currency notes. 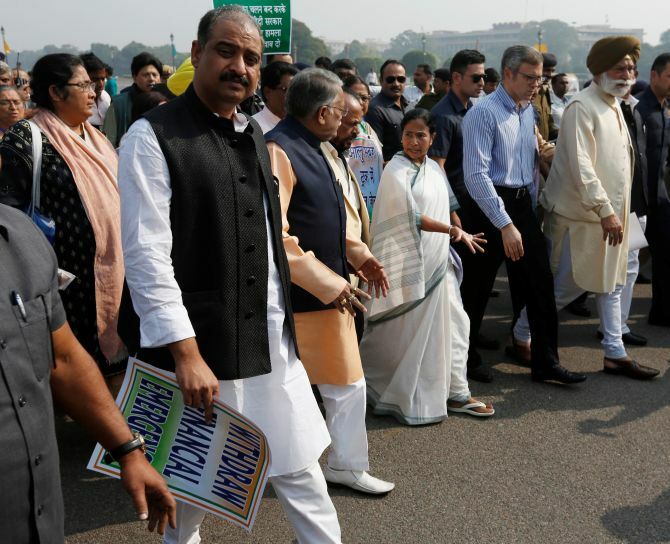 Banerjee led a march to Rashtrapati Bhavan from Parliament along with Trinamool Congress MPs, AAP MP Bhagwant Mann, Shiv Sena MP Anandrao Adsul, National Conference leader and former Jammu and Kashmir Chief Minister Omar Abdullah among others. “We had a successful meeting with the President during which we discussed the issue. And the President said he would look into the matter,” she said, after emerging out of the Rashtrapati Bhawan. She said the situation arising out of demonetisation has triggered a sort of constitutional crisis. Speaking about her next move on the issue, she said “Our party will move adjournment motion in Lok Sabha”. Leaders of the other opposition parties including Congress, Left parties, Samajwadi Party and Bahujan Samaj Party did not took part in the protest march. Describing as “dictatorial and draconian step” the government’s demonetisation move, the memorandum has sought its immediate suspension. Mann said the ban has affected the normal functioning of the household as there is no money available. However, the Shiv Sena differed on the issue and insisted the government to extend the deadline of accepting the old currency notes. “We welcome the demonetisation move. But we are against the inconvenience caused to people due to it. We have not signed the memorandum (that will be presented to the President Pranab Mukherjee). “We are going to submit a separate memorandum seeking redressal of the inconvenience caused to people. We also want the period to be extended,” said Gajanan Kirtikar of Shiv Sena who took part in the march.